Mix water, sake, cornstarch, hoisin sauce, oyster sauce, soy sauce and chili puree. Heat wok or 12-inch skillet over high heat. Add oil; rotate wok to coat side. Add shrimp, garlic and gingerroot; stir-fry 1 minute. 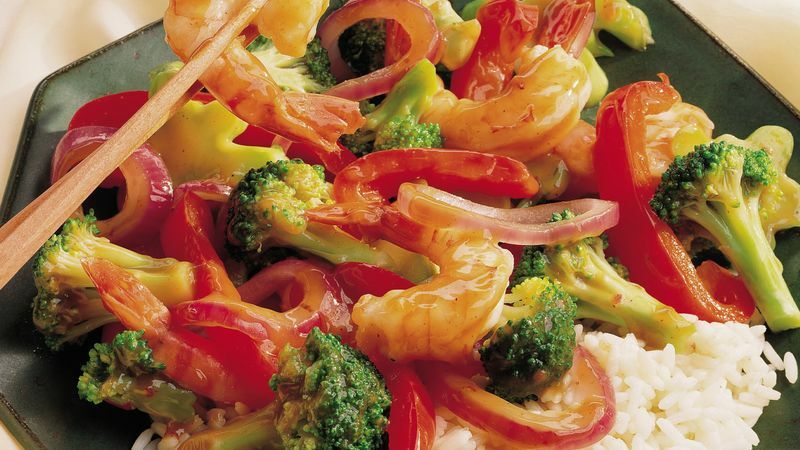 Add broccoli, bell pepper and onions; stir-fry until shrimp are pink and firm. Stir in sake mixture. Heat to boiling, stirring constantly. Boil and stir 1 minute. Sprinkle with peanuts. Serve over rice. A hot 'n spicy sauce, chili puree is made from chilies, soybeans, salt, oil and garlic. It is used both as a seasoning and a condiment. Shrimp are generally sold by number or "count" per pound, and that can be confusing because "counts" vary among suppliers and markets. Don't hesitate to ask your grocery store for clarification.